Reading short stories is the only way to learn how to write one. Osmosis isn’t working so I’m afraid I’m going to have to do this the hard way. 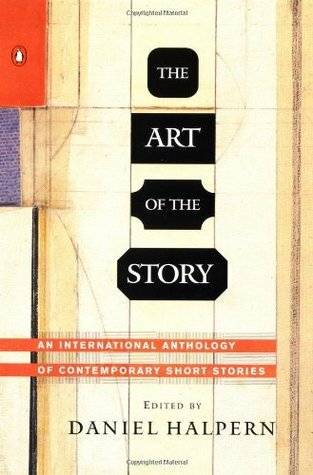 Hence my self-imposed assignment to read The Art of the Story: An International Anthology of Contemporary Short Stories. Of course, it has to be a good one. Here are my favorites out of Halpern’s collection. For each one, I’ve tried to identify some excellent craft feature. But truth to tell, I still don’t read like a writer but as a normal person would: for sheer pleasure. I love a good old-fashioned omniscient narrator. Forget about seeing the world only through the eyes of a single character. Atwood takes us into the hearts and minds of three sisters – Pamela, Prudence, Portia – and their brother Roland, the eternal odd man out. It was the mother (Prue explained) who had been guilty of the daughters’ alliterative names. She was a whimsical woman, though not sadistic …. Roland had been left out of the set, at the insistence of the father. It was Prue’s opinion that he had always resented it. who spent the forties rooting through garbage heaps and begging, and doing other things unsuitable for a child. this lake, this peninsula, Wacousta Lodge itself, are his refuge, his monastery, his sacred ground. Here he will perform no violations. Most of us (readers and writers) like to know where we are before we dive headlong into a story. Dialogue is a tricky way to set the scene. That may be why only two stories in this collection open in that way. Dialogue forms the heart of this story. The narrative arc is the length of one telephone call and its immediate aftermath. Melanie has news for her father and her father has news for her. But the shock of her announcement silences the father. It’s not until he hangs up that we hear his story, slow mourning and old, a bass melody that was playing along all the time though we hardly heard it. He shut his eyes, listened to the small sounds [his wife] made in the kitchen, arranging her flowers, running the tap. Mary, he had said. But he could not imagine what he might have found to say if his voice had reached hers. I know Jim Crace’s work from his 2013 novel Harvest. It’s an elegy to the English countryside during a clash of civilizations: subsistence farming versus wool production. I thought his short story would be rooted in that same verdant vision of England. This is England, alright, but a rocky one. Ibela-Hoy, the Hill without a Hat, is a lunar landscape of boulders and dry beds, underneath which wealth must lie hidden. Sand is what the mining company wants but its agent dreams of diamonds. The prospectors would be happy with anything salable: animal, vegetable or mineral. The narrator is so far inside the head of the company agent that we, the readers, come to believe in his delusions, too. Sometimes he wrapped his arms around boulders, warmed by the sun, and embraced them. My wife, he said. He kissed boulders. It’s the language I love about Colum McCann. It’s not lyrical in the sense that McCann’s made stuff up. These opening lines are deeply real. It was a summer flood when our draft horse was caught in the river and the river smashed against stones. The sound of it to me was like the turning of locks. It was silage time and the water smelled of grass. The horse is a favorite and so father and daughter struggle to release the horse before it drowns. They almost give up when they hear a car on the road. Soldiers pile out to help. It should be the start of a happy ending but this is Ireland. The lights got close close closer, and in the brightening we heard shouts and then the voices came clear. They sounded like they had swallowed things I never swallowed. The night had started stars. Here’s another omniscient narrator, in this case a mobile one, who slips from Mrs. Singleton to Mr. Singleton and ends with their son Paul. The opening sentence is brilliant in setting up the central conflict. Mrs. Singleton had three times thought of leaving her husband. The counting is a structural thread. Mr. Singleton, too, has thought of leaving his wife, though in his case only twice. The sea is the second bit of connective tissue, tying the past (Greece) to the present (Cornwall) and the battle that swimming has become. Swimming was once freedom to Mr. Singleton. It wasn’t the medals and trophies that made him glad, but the knowledge that he didn’t have to bother about anything else. Swimming vindicated him. Swimming is now a trial for 6 year old Paul Singleton. His parents are fighting a battle and he’s the prize. he was afraid of his father and his gripping hands. And he was afraid of his mother, too. How she would wrap him, if he came out, in the big yellow towel like egg yolk, how she would want him to get close to her smooth, sticky body, like a mouth that would swallow him. The transitions Swift makes to take the reader out of one head and into the other are brilliant. He doesn’t use line breaks or other clumsy markers to warn the lazy reader of the sharp turn ahead. Swift trusts that the reader is as intelligent as his writing. Last but not least is this tale by Tobias Wolff. I’ve gushed about this short story before when I first met it in the form of a New Yorker podcast. It’s magical to hear the words read out loud but it’s fun to see them on the printed page, too. This is a classic story within a story. The smaller one is a sermon about Mike who’s working the switch at the drawbridge one night. He’s got an impossible choice. Does he close the bridge so that the train can cross or does he save his own son lost inside the engine room, that terrible place they call the mill? The larger drama is between Frances and Frank, brother and sister. She has protected him all her life against landlords and debtors and their own father. She demands that Frank does the same. The thing I love about the story is Wolff doesn’t tell you how it ends. He never says what Mike the switchman did. Just as we don’t get to hear Frank’s answer to his sister. But we know anyway.